The northern mockingbird (Mimus polyglottos) is a gray songbird that possesses a sizable geographic scope including North America and various Caribbean settings, from the Cayman Islands to Puerto Rico. Although not all northern mockingbirds migrate each year, many do. If you think you spotted -- or heard -- one of these guys in your garden, you probably did. Northern mockingbirds are lithe birds that are notoriously chanty. With these birds, the vocal performances rarely seem to end, and that includes during the night hours. Strangely enough, northern mockingbirds are skilled copycats, and often can even replicate sounds such as those of ringing cell phones, human whistling and alarms. Male northern mockingbirds without mates are particularly noisy. These birds usually grow to lengths of between 8.3 and 10.2 inches, notes the Cornell Lab of Ornithology. The typical weight of these diurnal mockingbirds is between 1.6 and 2 ounces. Although their bodies are gray on top, their underbellies are white. Their reproductive season generally starts in March and ends in August. 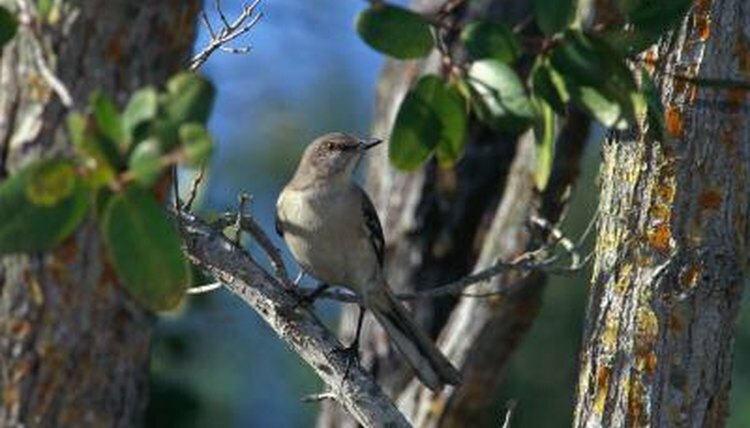 The majority of northern mockingbirds are residents and therefore do not migrate, according to the Birds of Stanford division of Stanford University. However, some northern mockingbirds do migrate for the colder months -- particularly those that live in northerly regions. Northern mockingbirds that reside in elevated altitude environments also frequently migrate each year. When northern mockingbirds do travel south, they typically head for the warmer weather of milder geographic locations such as Mexico, the Caribbean islands and the Bahamas. Northern mockingbirds are not uncommon in areas with many people, including residential neighborhoods, urban public parks and edges of roads. They are also prevalent on agricultural sites, desert brush, outskirts of forests, farmlands and in thickets. These insect eaters are not particularly picky about their living environments. Northern mockingbirds generally gravitate toward open habitats, especially those that feature ample shrubs. When it comes to nest construction, the mother and father birds work as teams. The materials that they use to create the nests are grass, foliage and sticks.